Reference number for this case: 30-sep-54-Blanzy. Thank you for including this reference number in any correspondence with me regarding this case. Yesterday, around 1 p.m., MM. Burato and Bastiani, living in Blanzy, aged 20, saw at 100 meters from the road where they were traveling, a machine in the form of a shell, brown, landed in a plowed field. The device emitted a fairly soft whistling sound. This is actually what caught their attention. Suffocated by this apparition, they no less put the feet on the ground to go closer, but the craft suddenly rose vertically and disappeared at breakneck speed. "It was not an optical illusion," said MM. Burano and Bastiani, who are perfectly balanced young men, excellent cyclists well known in Burgundy, in addition. "A roadmender sees a strange apparatus posed on the ground, with assistance of crutches! But when he approached of the craft, he is paralyzed by an invisible ray." "I felt, he said, paralyzed, and my sight was slightly scrambled. I then saw the saucer rise very slowly, without noise, in the manner of a falling leaf up to 25 meters of the ground. It was motionless one moment, then, still without noise nor any luminous trail, it disappeared at sharp pace." 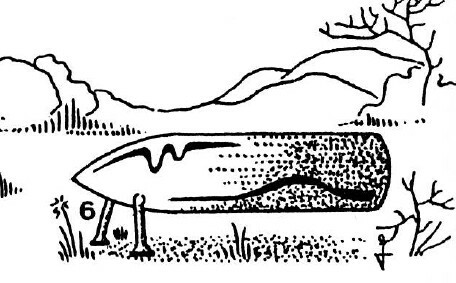 The author indicates that in Blanzy in the Saone-et-Loire, two men saw a cigar-shaped thing in a freshly plowed field. It was about six feet long with a pointed yellow terminal, the rest of it was dark brown. As they approached, the fusiform object rose into the sky vertically. The author indicates that on October 1, 1954, an object in the shape of a cigar flew away vertically at the time when two brick-makers approached, on the road between Blanzy and Montceau (France). It made a noise comparable to a soft whistle. "The machine was approximately 2 meters long and had the width of a tree. The pointed end was yellow, the remainder of the cigar, brown. In the front of the machine, two feet which hung (sic) rested on the ground. At the time when we were going to approach the apparatus, the cigar rose vertically, at high speed, before disappearing with a very gentle whistle." Oct. 01, 1954 01:00 P.M. Blanzy (France). Two bricklayers, Sebastiani and Buratto, approached a cigar-shaped object 3 m long, 80 cm wide, which took off from the ground with a whistling sound. The pointed section of the object was yellow, the rest brown. From the fore part, two appendages extended to the ground. (30) (Le Figaro, Le Parisien, Oct. 2, 1954; La Croix, France-Soir, Paris-Presse, Oct. 3, 1954). 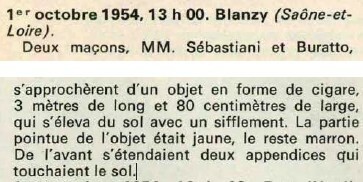 The two French authors and ufologists report an observation to Blanzy in Haute-Saône on September 30, 1954 to 13 hours. The witnesses are two cyclists, Romain de Bastiani and Bruno Burato, aged of respectively 21 and 20, who were going to their work on the road of Blanzy, in the Saint-Louis district. "It was a gentle whistle which drew our attention. It was hardly within 100 meters of us. It was approximately two meters long. It had the size of a large tree. At its front, it rested on the ground by two feet." The two cyclists stopped in wonder, and see the machine then rising vertically at high speed with "a very soft" whistling sound. A few minutes later, when they recovered their calm, the two witnesses left their bicycles on the roadside and went to the place where the machine had been, but did not find any trace on the ground. October 1st, 1954, 01 p.m.. Blanzy (Saône-et-Loire). Two masons, MM. Sebastiani and Buratto, approached a cigar-shaped object, 3 meters long and 80 centimeters wide; which rose from the ground with a hissing sound. The pointed part of the object was yellow, the rest was brown. Forward extended two appendices touching the ground. 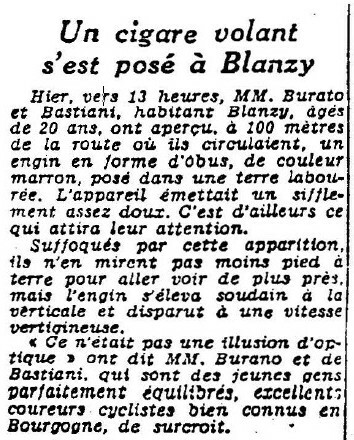 The two authors indicate that on September 30, 1954, at 01:00 p.m. on the road of Blanzy in the Saone-and-Loire, in the district St Louis, two cyclists, Romain de Bastiani, aged 21, and Bruno Burato, aged 20, who were going to their work observed a machine in the shape of a cigar in a field. "It is a gentle whistling sound which drew our attention. The object was within 100 meters of us hardly, it had the size of a large tree and its front rested on two feet." The two cyclists stopped and then saw the machine rising vertically while emitting a "very soft" whistling sound. They go to the site of the landing, but do not find any trace. The authors note that Vallée has the date wrong because the sighting was on a Thursday, and indicate Vallée, Garreau as ufological sources and Le Figaro and Le Parisien for October 2, 1954 and La Croix, France-Soir and Paris-Presse for October 3, 1954, as newspapers sources. A "cigar volant," or what some Frenchmen called a "Churchill," an affectionate allusion to the famed British Prime Minister who was always seen with his mouth clamped on a big roll of tobacco; was reported on the first of the month"at Blanzy, France, at 1:00 in the afternoon. According to two brick layers, M. Romain Sebastiani and M. Bruno Buratto, they viewed a cigar-like object that flew with a whistling sound. This "cigar volant" was on the small side, however, an object the men said was about 3 meters long and some 80 milimeters in diameter. The pointed nose, the witnesses claimed, was a yellow color and the remainder of the body brown. A pair of long appendages were said to be attached to the object's nose section. (This UFO seems unlike any other that was reported so there is a chance the story is a hoax) 3. The source "3" is indicated as "3. Paris, France. Le Figaro. 2 October 54." Joseph Trainor indicates that in France on October 2, 1954, at Blanzy in the Saone-et-Loire department, two men saw a cigar-shaped thing in a freshly plowed field. It was about six feet long with a pointed metal terminal. As they approached, the fusiform object rose into the sky vertically. The Belgian ufologist indicates that in 1954, on September 30, in France, in Blanzy, according to the version of the press, "13 h. Two masons, Misters Sébastiani and Buratto, approached an object in the shape of a cigar, 3 meters of length and 80 centimeters broad, which rose ground with a whistling sound. The pointed part of the object was yellow, the remainder brown. At the front two appendices extended which touched the ground ". The sources are noted: "Le Figaro, Le Parisien, 2 Oct. 1954; la Croix, France-Soir, Paris-Presse, 3 Oct. 1954" avec un remerciement à Wim van Utrecht. She indicates that another version is: "Thursday, September 30 towards 13:00 two masons, Misters Romain De Bastiani (Sébastiani?) and Bruno Burato (Buratto?) in the Saint Louis district, approached at 100 m of an object in the shape of a cigar, 3 m in length and 80 cm broad, which rose from the ground vertically with a very soft whistling sound. The pointed part of the object was yellow, the remainder brown. (From the front two appendices extended which touched the ground)." The sources are noted "M. FIGUET: J.L. RUCHON: 'Ovni, le premier dossier complet...' Alain Lefeuvre pub. 1979, p. 94, 95" and "Jacques Vallée: 'Chronique des apparitions ET' - DENOEL 1972 - J'AI LU COLL. - p. 263 who cites October 1 and gives the name in the parenthesis", "'Historia' special issue #46 in 1976: Les soucoupes volantes, p.42, extr. from: Jacques VALLEE : 'Chroniques des apparitions extraterrestres'". Two bricklayers, Sebastiani and Buratto, approached a cigar-shaped object 3 m long, 80 cm wide, which took off from the ground with a whistling sound. The pointed section of the object was yellow, the rest brown. From the forepart, two appendages extended to the ground. 1954 - At one o'clock in the afternoon in Blanzy, France two bricklayers, Romain de Bastiani, age 21, and Bruno Burato, age 20, witnessed a partially yellow, partially maroon colored cigar-shaped object landed on the ground. They started to approach the three-meter long object when it took off from the ground with a whistling sound. The pointed section of the object was yellow; the rest of the object was reddish-brown. Two foot-like appendages extended to the ground from the fore section. (Sources: Le Figaro, October 2, 1954; Jacques Vallee, Passport to Magonia: A Century of Landings, p. 214; Michel Figuet and Jean-Louis Ruchon, OVNI: Le premier dossier complet des rencontres rapprochees en France, pp. 94-95). Luc Chastan indicates that in the Saone et Loire in Blanzy, on September 30, 1954, at 13:00 hours, "On the road from Blanzy to the district of St Louis, two cyclists going to their work observe in a field a cigar-shaped craft. "It's a gentle whistling sound which drew our attention, the witnesses specify. The object was hardly at 100 m from us, it had the size of a large tree and rested at the front on two feet." The two cyclists stop and then see the craft rise vertically while emitting 'a very soft' whistling sound. They go to the site of the landing, but do not find any trace." The website indicates that on 30 September 1954 at 13:00 in Montceau-les-Mines, France, "Cigar rests on two legs. Flies away making whistling sound as two cyclists approach." And: "An object was sighted that had an appearance and performance beyond the capability of known earthly aircraft. One cigar-shaped object was observed by two witnesses at a mountain for two minutes." 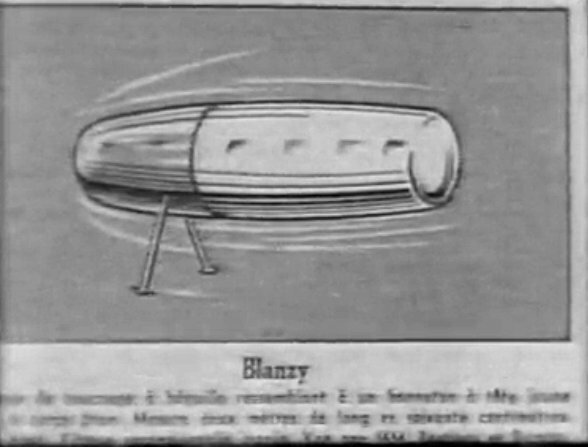 *1 oct. 1954 - At 1:00 p.m. two bricklayers, Sebastiani and Buratto, approached a cigar-shaped object in Blanzy, Saone-Loire department, France that was sitting on the ground. It was three meters long, 80 cm wide, and it took off from the ground with a whistling sound. The pointed section of the object was yellow, the rest brown. From the fore part, two appendages extended to the ground. (Source: Jacques Vallee, Passport to Magonia: A Century of Landings, p. 214, case 170). Ufologists Garreau and Lavier date the case of September 30, 1954, not October 1st, 1954. [---] Article in the national newspaper Le Parisien, Paris, France, October 2, 1954. [nm1] Article in the regional newspaper Nord-Matin, France, October 3, 1954. [vm1] Article in the regional newspaper Var-Matin - République, France, October 3, 1954. [---] Article in the national newspaper La Croix, Paris, France, October 3, 1954. [---] Article in the national newspaper France-Soir, Paris, France, October 3, 1954. [---] Article in the national newspaper Paris-Presse, Paris, France, October 3, 1954. [hw1] "Flying Saucers Uncensored", book by Harold T. Wilkins, Pyramid Books publisher, USA, page 57, 1954. [mc1] "Les Apparitions de Martiens", book by Michel Carrouges, (aka Louis Couturier), Fayard publisher, France, page 90, 1963. [jv1] Summary by Jacques Vallée in "The Humanoids: A Survey of World-wide Reports of Landings of Unconventional Aerial Objects and Their Alleged Occupants", book by Charles Bowen, Neville Spearman publisher, USA, 1969. [jv1] Summary by Jacques Vallée in "En Quête des Humanoïdes", book by Charles Bowen, French translation of "The Humanoids", J'ai Lu publisher, France, page 39, 1974. [jv2] "Chronique des Apparitions Extra-Terrestres", French translation of "Passport to Magonia", book by Jacques Vallée, Denoel publisher, France, page 263, 1972. [gl1] "Face Aux Extraterrestres", book by Charles Garreau et Raymond Lavier, Jean-Pierre Delarge publisher, France, page 210, 1975. [jv7] "1954, 7 jours, 40 Observations", article by Jacques Vallée, in the popular history magazine Historia, France, special issue "Les Soucoupes Volantes" #46, page 42, 1976. [fr1] "OVNI, Premier Dossier Complet Des Rencontres Rapprochées En France", book by Michel Figuet and Jean Louis Ruchon, Alain Lefeuvre publisher, France, pp 94-95, 1979. [lg1] "The Fifth Horseman of the Apocalypse - UFOs a History - 1954: October", monography by Loren Gross, USA, page 1, 1991. [lg2] "The Fifth Horseman of the Apocalypse - UFOs: a History - 1954 October - Supplemental notes", by Loren Gross, USA, pp 5-6, 2002. [dj1] "Encounters With Aliens On This Day", web page compiled by Donald A. Johnson, Ph.D., compiled from the UFOCAT 2003 computer database, www.ufocat.com. 0.1 Patrick Gross September 21, 2007 First published. 1.0 Patrick Gross February 11, 2010 Conversion from HTML to XHTML Strict. First formal version. Additions [go1], [lc1], [ud1]. 1.1 Patrick Gross March 11, 2010 Addition [fd1]. 1.2 Patrick Gross September 13, 2014 Addition [nm1]. 1.3 Patrick Gross September 26, 2014 Addition [qs1], [ni1]. 1.4 Patrick Gross November 22, 2016 Additions [lg1], [ub1]. 1.5 Patrick Gross January 11, 2017 Addition [nr2].